Pigs in a pen in a village in Linquan County, China. Farmer Gao Yongfei owns a herd of 5,500 pigs in the town of Yueqing, in China's southeastern Zhejiang province. Farms near his have lost hundreds of pigs to the African swine fever. Farmer Gao Yongfei is paying much closer attention to his more than 5,000 pigs than ever before. That's because hundreds of pigs at farms nearby are dying from a mysterious virus, and Gao and his staff are now vigilantly checking his herd for symptoms of African swine fever. "You know the pig is sick if its mouth has turned dark and it's acting crazy," says the 64-year-old owner of Yongfei Livestock Farm. "When you find a pig that has the fever, you need to slaughter it immediately." 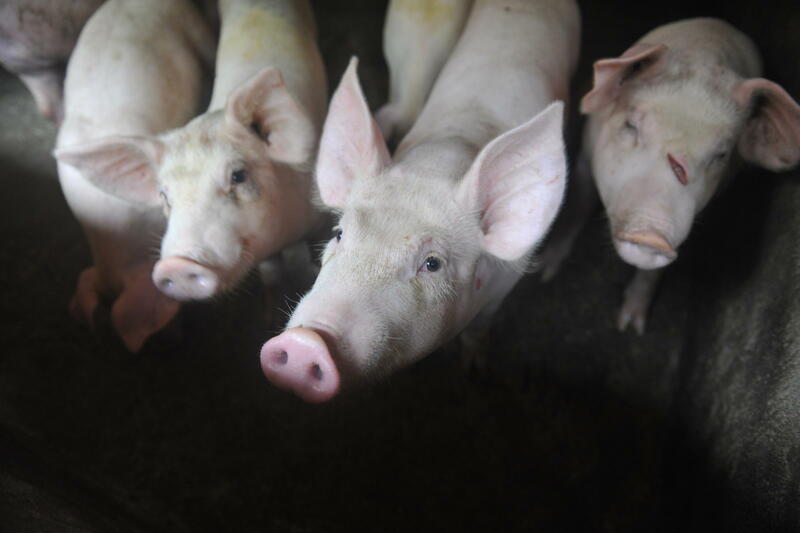 Yongfei Livestock Farm is in Yueqing, a city in China's southeastern province of Zhejiang, the third place in China where authorities reported an outbreak of African swine fever in mid-August. Since then, there have been seven additional outbreaks, one every few days or so, each of them hundreds of miles away from the last. In a little more than a month, some 897 pigs have died and nearly 20,000 have been culled to try and prevent the virus from spreading. "It's spreading very quickly, and this disease is very dangerous," says Gao. "We're all scared." Scientists are worried, too. Jurgen Richt, a professor of veterinary medicine at Kansas State University, is an expert on African swine fever. He says although the virus does not affect humans, it has shown a capacity to kill herds of pigs quickly. It's highly contagious, and infected pigs die within five to 10 days. "And it's not only the problem that this virus is deadly for pigs," says Richt. "The problem is also we do not have a vaccine. So the only strategy we have is to keep it controlled and keep it out from noninfected areas." That may prove to be difficult in a place like China, says Richt, home to more than 700 million pigs — about half the world's population. "This is really big, because it hits the biggest pig population in the world." Richt says another challenge is that the virus can also be carried by wild boars and ticks, which both live in China. Richt also worries about the fact that many pigs in China live inside backyard farm operations, which are difficult for authorities to regulate and control. In early August, China recorded its first African swine fever outbreak in the city of Shenyang, in northeastern China. Scientists believe pigs there may have eaten food scraps from a train that had come directly from Russia, and that among the infected pork was among the scraps. Less than two weeks later, pigs nearly a thousand miles away in the central Chinese city of Zhengzhou were infected. Three days after that, nearly 800 miles south in farmer Gao's city of Yueqing, another outbreak. Scientists believe that the virus spread so far so quickly because of pigs being shipped across China by farmers and buyers. Pan Chenjun, a Hong Kong-based senior agricultural analyst at Rabobank, a Dutch banking company, says the virus's spread will have a big impact on how pork is bought and sold in China. "The direct impact on pork is that China will maybe pay more to source enough pork from other countries," says Pan. And that will be tricky now that China's in a trade war with the United States and has imposed tariffs on imported American pork. Pan says China will likely turn to European pork suppliers instead. Back on the pig farm in Zhejiang province, Gao is worried about China turning to pork from other countries. "Pork is an important part of the Chinese diet," he says. "It makes up two-thirds of our meat consumption. If we start importing pork, I won't make as much money." But Gao stands to do well for now: Pork prices in his part of China have increased 23 percent since the outbreak of African swine fever. The key, he says, is to keep his pigs healthy — something that will become more difficult to do as this virus spreads throughout China. NPR Shanghai Bureau Assistant Xu Yuhan contributed research to this story. China is home to about half the world's population of pigs. That is why authorities there are scrambling to contain outbreaks of the African swine fever. This is a deadly virus that has killed thousands of pigs and is now spreading fast. It could lead to skyrocketing prices. And that's a big worry in China, which is the world's largest consumer of pork. NPR's Rob Schmitz has more. ROB SCHMITZ, BYLINE: Farmer Gao Yongfei has never paid more attention to his herd of more than 5,000 pigs. That's because just over a week ago, hundreds of pigs at nearby farms started dying from a mysterious virus. And now Gao and his staff are checking his stock for symptoms of African swine fever. GAO YONGFEI: (Through interpreter) You know the pig is sick if its mouth has turned dark, and it's acting crazy. When you find a pig that has the fever, you need to slaughter it immediately. SCHMITZ: Gao's pig farm is in Yueqing, a city in China's southeastern province of Zhejiang. It was the third place in China where authorities reported an outbreak of African swine fever since early August. In a little more than a month, around 900 pigs have died and tens of thousands have been killed to try and prevent the virus from spreading. GAO: (Through interpreter) It's spreading very quickly, and this disease is very dangerous. We're all scared. SCHMITZ: So are scientists. Juergen Richt, a professor of veterinary medicine at Kansas State University, is an expert on the African swine fever. He says, although the virus does not affect humans, it's shown a capacity to kill herds of pigs quickly. It's highly contagious, and infected pigs die within 5 to 10 days. JUERGEN RICHT: It's not only the problem that this virus is deadly for pigs; the problem is also we do not have a vaccine. SCHMITZ: And without a vaccine, says Richt, China is particularly vulnerable. RICHT: This is really big because it hits the biggest pig population in the world. SCHMITZ: And the virus has been traveling fast. In early August, China recorded its first outbreak in the city of Shenyang in northeastern China. Scientists believe pigs there ate scraps with infected pork from nearby Russia. Less than two weeks later, pigs nearly a thousand miles away were infected. Then, two days later, 800 miles south of that in farmer Gao's city of Yueqing, another outbreak. Pan Chenjun, a senior agricultural analyst at Rabobank in Hong Kong, says the virus's spread will have a big impact on how pork is bought and sold in China. PAN CHENJUN: Directly impact on pork is that China needs to maybe pay more to source enough pork from other countries. SCHMITZ: And that, says Pan, will be tricky now that China's in a trade war with the United States and has imposed tariffs on imported American pork. Pan says China will likely turn to European pork suppliers instead. 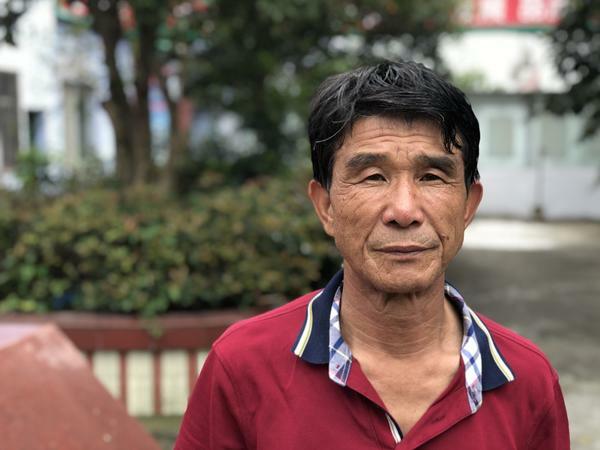 SCHMITZ: Back on the pig farm in Zhejiang province, farmer Gao Yongfei is worried about China turning to pork from other countries. GAO: (Through interpreter) Pork is an important part of the Chinese diet. It makes up two-thirds of our meat consumption. If we start importing pork, I won't make as much money. SCHMITZ: But farmer Gao stands to do well for now. Pork prices in his part of China have increased 23 percent since the outbreak of African swine fever. The key, he says, is to keep his pigs healthy, something that will become more difficult to do as this virus spreads throughout China. Rob Schmitz, NPR News, Zhejiang province. Transcript provided by NPR, Copyright NPR.